WHEN aliens seize and torture Dr McCoy in “The Empath”, an episode of the science-fiction series “Star Trek”, Captain Kirk and Mr Spock rush to his aid. They are able to assess his condition in seconds with the help of a medical tricorder—a hand-held computer with a detachable sensor that is normally used by Dr McCoy himself to diagnose others. A quick scan with the tricorder indicates that he suffers from “severe heart damage; signs of congestion in both lungs; evidence of massive circulatory collapse”. Among the organisations pushing for the development of a medical tricorder is the X Prize Foundation, an organisation that aims to spur innovation by offering cash prizes. Earlier this year it announced the Qualcomm Tricorder X Prize, financed by the Qualcomm Foundation, the charitable arm of Qualcomm, a maker of wireless communications technologies. It has put up $10m in prize money and another $10m to pay for the administration of the competition. So far more than 230 teams from over 30 countries have applied to enter the contest, the guidelines for which will be finalised this month. The goal is to create a mobile platform that will enable people to diagnose a set of 15 conditions, including diseases as varied as pneumonia, diabetes and sleep apnoea, without having to rely on a doctor or nurse. “Ultimately this is about democratising access to health care around the world,” says Peter Diamandis, the head of the X Prize Foundation. But the obstacles to building a medical tricorder are not merely technological. Regulatory agencies such as America’s Food and Drug Administration (FDA) may delay or restrict consumers from getting their hands on such devices, and the medical establishment, infamous for its inertia, may be wary of granting patients a more active role in diagnosis. Many doctors do not believe that patients can be trusted with their own medical data and are reluctant to give them access to it, explains Eric Topol, a cardiologist and the author of “The Creative Destruction of Medicine”. He believes the push to adopt new digital technologies in health care will have to come not from doctors but from the public. Making self-service diagnostic technology cheaper and more widely available would, however, have enormous benefits in both rich and poor parts of the world. The Association of American Medical Colleges projects that America could have 90,000 doctors fewer than it needs by 2020, as doctors retire, the population ages and chronic illnesses become more prevalent. All this will place huge demands on America’s sprawling health-care system, and threatens to increase health-related spending still further. Other rich countries are also looking for ways to keep a lid on rising health-care expenditure. The prospects for creating a medical tricorder have been boosted enormously by the spread of mobile phones. There are now more than 6 billion in use around the world, of which around 1 billion are smartphones—in effect, powerful, internet-capable pocket computers. Even without any additional hardware or software, a phone can be a useful medical device. Some health-care organisations already send out text messages to patients’ mobile phones, for example, reminding them to take their medicine, renew their prescriptions or visit a doctor. Add some extra software in the form of downloadable apps, and the cameras and video recorders built into more advanced handsets can be used as sensors to measure or track vital signs, such as heart and respiration rates. Add hardware in the form of sensors that plug into the phone or connect to it wirelessly, and a phone can become an even more powerful tool for monitoring and diagnosis. At the moment there is only draft guidance from the FDA on which medical apps require review. A review is deemed necessary only for mobile-health apps that are used in conjunction with already regulated medical devices, or that would transform a mobile device, such as a smartphone or tablet, into a regulated medical device, typically in conjunction with sensors or attachments that help with diagnosis or treatment. The FDA says its final guidelines will be available by the end of the year. In addition, it intends to regulate clinical decision-support software, which helps make diagnoses or recommends treatments. This will be tackled separately from mobile medical apps, says Bakul Patel, a policy adviser at the FDA. Draft guidance should be available in the coming months, he says. Mr Patel says the FDA wants to encourage innovation while ensuring patient safety. But not everyone thinks the FDA can keep up with this burgeoning new field. “The technology is evolving much faster than the regulations are,” says Dr Diamandis. The amount of money flowing into digital-health start-ups is rising fast. Rock Health, a non-profit incubator in San Francisco that tracks deals in this field, says 128 venture-capital firms invested a total of $1.1 billion in more than 100 digital-health firms in the first nine months of 2012, an increase of 70% over the $626m invested in the same period in 2011. The number of deals rose by 84%. Handset-makers and wireless companies are also investing in mobile health and the development of mobile diagnostic devices. Nokia, a large handset-maker, has agreed to sponsor the $2.25m Sensing X Challenge, another competition being run by the X Prize Foundation that is intended to speed up the development of medical sensors for tricorders. And as well as financing the Tricorder X Prize competition, Qualcomm’s venture-capital arm has put money into several promising start-ups in the area, including San Francisco-based AliveCor, which has developed an iPhone case with two electrodes that can perform an electrocardiogram (ECG). Dr Topol recently used a prototype to assess a fellow passenger on an aircraft who was suffering from chest pain. He concluded the passenger was having a heart attack, and the plane was diverted. Other firms are also developing medical add-ons for smartphones. 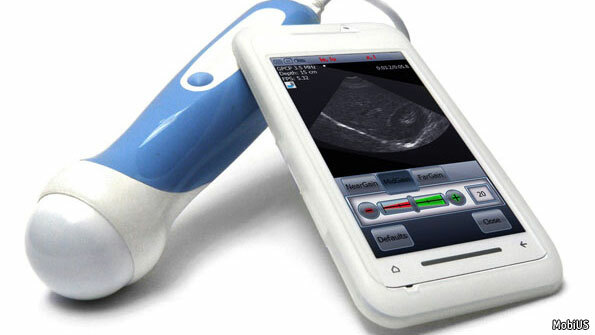 MobiSante, based in Redmond, Washington, has devised a smartphone-based ultrasound system that was granted FDA clearance in early 2011. A hand-held ultrasonic probe plugs into a smartphone, which generates and displays an image. It costs $7,500, a fraction of the price of a conventional ultrasound. Another smartphone attachment is the iBGStar, a sleek glucose-monitoring device for diabetics that plugs into an iPhone. Sold by Sanofi, a French drugs giant, it measures glucose levels in blood using a technology called WaveSense, developed by AgaMatrix, a firm based in Salem, New Hampshire. A test strip is put into the device and a drop of blood is applied from a tiny pinprick. 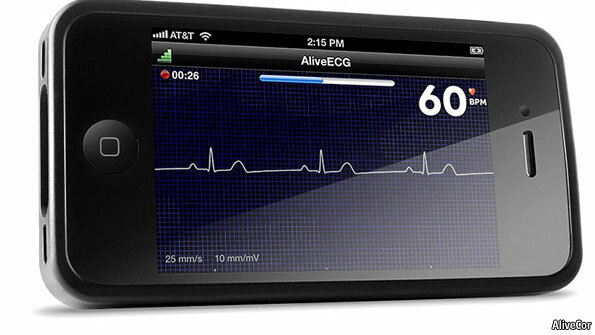 The glucose level appears on a small display and is stored by an app on the iPhone, allowing for long-term monitoring. It was cleared by the FDA in December 2011. These devices do specific things rather than being general-purpose devices. But Don Jones, head of business development at Qualcomm Life, argues that they could be regarded as specialised forms of a medical tricorder. Depending on need and location, he suggests, a tricorder’s design could be customised to perform different tasks. A good example is the CellScope, a project that originated in 2006 in Daniel Fletcher’s laboratory at the University of California, Berkeley, and has since spawned a start-up with the same name based in San Francisco. The CellScope is an attachment that turns a smartphone into a microscope. Several versions with different resolutions have been developed that allow the technology to be used for different things. The academic group is developing versions of the CellScope that can be used for retinal scans or to detect pathogens, such as malaria and tuberculosis, by analysing images of slides smeared with samples of blood or sputum. Fifteen prototypes are currently being tested at clinics in Vietnam in collaboration with TB Reach, an initiative of the STOP TB Partnership, which is funding the project. Together with other academic partners, the group has developed software to automate the diagnosis of TB when no doctor is available. Meanwhile CellScope, the start-up, is designing optical attachments for the American market that turn smartphones into “digital first-aid kits”. The first is an otoscope (a device for looking inside the ear) that clips onto an iPhone. 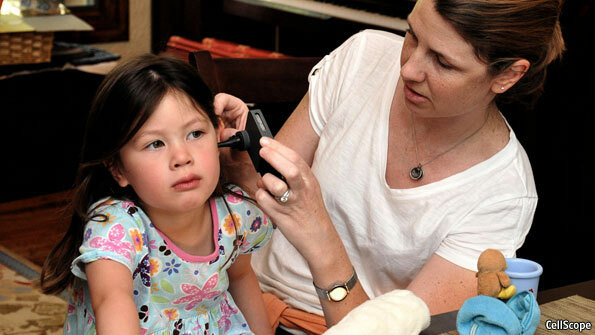 It could be used by doctors for diagnosis and visual record-keeping, or by parents to transmit images to paediatricians for the remote diagnosis of children’s ear infections, which cause millions of visits to the doctor each year. CellScope’s boss, Erik Douglas, says the firm is conducting a study with doctors from the Atlanta Pediatric Device Consortium to see how its device compares with standard digital otoscopes. He hopes it will go on sale next year for less than $200. The firm that is making the most tricorder-like gizmo is arguably Scanadu, based in Mountain View, California, which was among the first companies to enter the Tricorder X Prize competition. 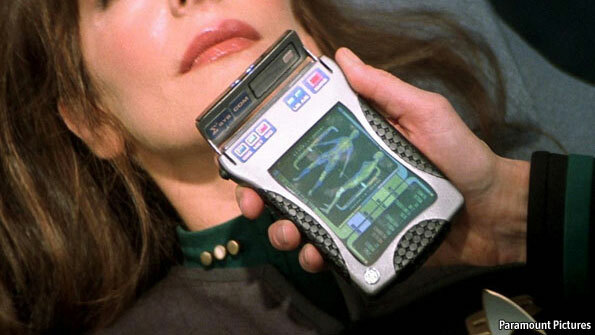 Its device, like Dr McCoy’s, consists of a small hand-held sensor unit that communicates wirelessly with a display unit (in this case, a smartphone). The sensor unit, called Scout, is placed in contact with the patient’s temple and detects a range of vital signs, including heart and respiration rate, blood oxygenation, pulse transit time and temperature. The current prototype includes electrodes to measure the electrical signals of the heart and an infra-red temperature sensor, among other things. A smartphone app displays and stores the data. So far the only blockbuster medical device to have become commonplace in the home is the thermometer, says Scanadu’s boss, Walter de Brouwer. His aim is for the Scout, which is small enough to be taken anywhere, to achieve similar ubiquity. “The idea is to make the tricorder for the consumer,” he explains. 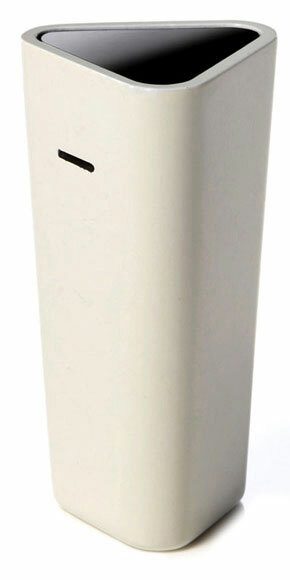 He hopes to have the first version on sale by the end of 2013 for around $150. At the same time, the company is developing disposable molecular tests for consumers, including the “ScanaFlu”, which will indicate the presence of strep throat, flu or other types of upper-respiratory infections. Patients gargle a special liquid and then spit into a cartridge containing test strips. A pattern of lines will appear to show which infections, if any, are present. The long-term aim is to bridge the gap between the Scout, which measures vital signs electronically, and the molecular tests which analyse samples. “We want to give patients more power to diagnose their own illnesses and keep track of their own health,” says Aaron Rowe, Scanadu’s research director. Moreover, doctors may be reluctant to use data collected by patients. Instead of measuring vital signs at an annual check-up, they could find themselves being asked to examine huge data sets created by patients—raising the question of legal liability if something is missed. “The irony is that a doctor is more comfortable with the liability in a system that does not have rich data than in a system that does have rich data,” says Mr Wasden. Another difficulty is that electronic health records are not designed to allow for the inclusion of patient-generated data, says Dr Chow. Some of the new diagnostic tools may be financially threatening to doctors, especially in disciplines such as optometry, dermatology and paediatrics, says Dr Topol. Why would you visit a specialist, he asks, when a mobile device lets you test your eyes, diagnose skin lesions or determine whether your child has an ear infection? But as medicine becomes more of an information science, some mundane and simple tasks could be taken over by patients, which could free up doctors for more demanding problems, argues Mr Jones.